At the request from my dear friends over at the Kremlin Stooge blog, I am writing this review of a piece by Petr Akopov. Akopov’s article reports on remarks made by Russian President Vladimir Putin yesterday (Thursday) at the Jubilee Session of the All-Russian Peoples Gathering (на юбилейном заседании Всемирного русского народного собора). Putin’s speech has aroused much interest in the Russophile community, as well as among Kremlinologists. This is a truly interesting topic, as it shows the thinking of the Russian leader, in his attempts to craft a new ideology, shall we say a new “purpose” for the Russian people! 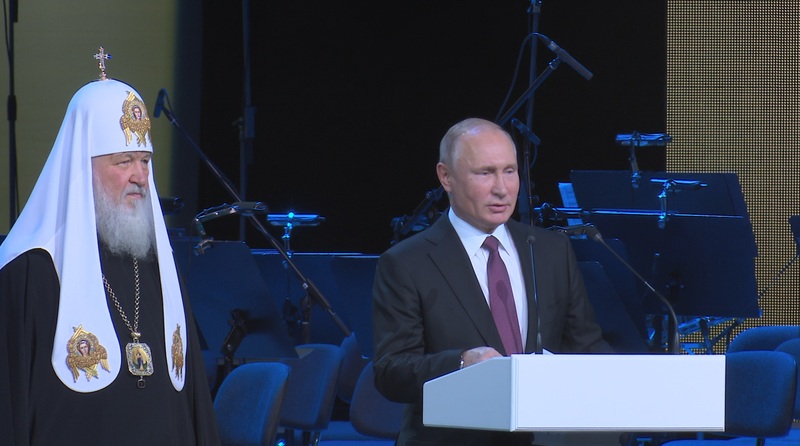 Putin delivers the opening remarks, with Kirill at his side. To put this speech in context, what is the All-Russian Peoples Gathering? For purposes of brevity, let us just call it the “Forum”. It is a social organization headed by Kirill, the Patriarch of Moscow and All Rus. This year marks the 25th anniversary of this organization, hence the “Jubilee” Anniversary. Doing the math, this organization was founded in 1993, the year of the so-called “Constitutional Crisis”. When Russian President Boris Yeltsin, with Bill Clinton cheering him on, illegally seized power and dissolved the Legislature. Army tanks shelled the Duma, and the casualties (political deaths) ranged from 187 killed (official reports) to 1,500 (non-official reports). This violent and bloody coup gave Yeltsin almost unlimited power (at least temporarily! ), completed the restoration of capitalism in Russia, and set the stage for the next 25 years of Russian political history — namely, the model of a strong President and a tamed Legislature. In the midst of all this political chaos, the “Forum” was founded by the Russian Orthodox Church leadership, with the purpose of providing the masses with a new ideology, and a new purpose, other than Communism. 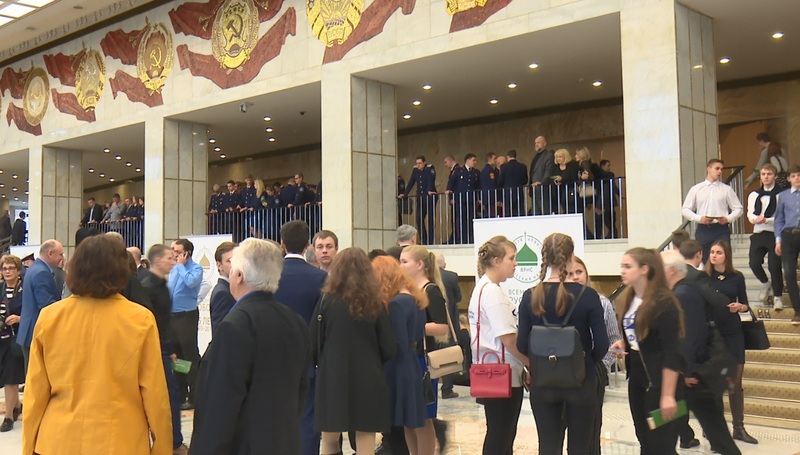 Forum guests gather beneath the Hammers and Sickles of the Kremlin Palace. In his own speech, Patriarch Kirill uttered: “Many ideas, first propounded at this Forum, have received further developments beyond its bounds. For example, ideas about the spiritual and moral regeneration of Russia, the issue of Russians as one of the biggest diasporas in the world, about the need to support our fellow Russians who live beyond the borders of the Russian Federation.” All of this, of course, taking place in the context of the current crisis in the Orthodox World, what with the Ukrainian Schism and all that! 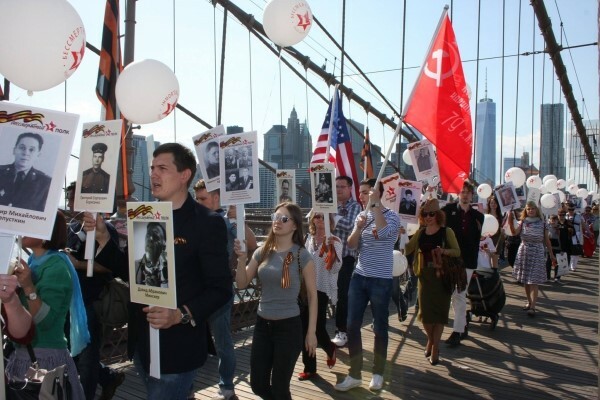 Russian Diaspora in NYC celebrates Immortal Regiment. But anyhow, as Akopov points out, the other “world” is the Whole World out there. A world filled with people who are not Russians and many of whom actually hate Russia’s guts. And here we are not talking about “gathering the tribes”, in the Biblical sense, nor about defending Russian speakers who live and are oppressed abroad; but about Russia’s place in the wider world. What does Russia have to offer the rest of the world in the way of ideology? And how can Russia defend herself against these often-hostile strangers? Is it even possible to defend oneself against attack, if one does not believe in one’s own rightness? Akopov: After the collapse of the USSR, and our country turning away from the communist ideology, people are constantly asking us, “Hey, Russians, what is your ideology nowadays?” And Vladimir Putin gave his own variant of the answer: Patriotism, love for the Fatherland, taking care of people. It is understood that this is not the description of a national(ist) idea, but just an outline of how the Russian man should live. It is also understood that this is how we describe ourselves to the outside world: Those highest values and concepts, with which Russian civilization is (should be) associated, in the eyes of the rest of humanity. Even if we can’t call this an actual ideology, then it is certainly a type of program, a proposition held out to the world, in other words, how do we actually see ourselves as a civilization? In earlier times, Russians were the bearers of the ideas of communism, of social justice, of the construction of “heaven on earth”, the striving for the stars. And now have turned away from all of that, have just turned into consumers, like everybody else. This is how both our friends and our enemies address us, whether with praise or reproach. We ourselves don’t even know, but we sense and feel that things are not right. 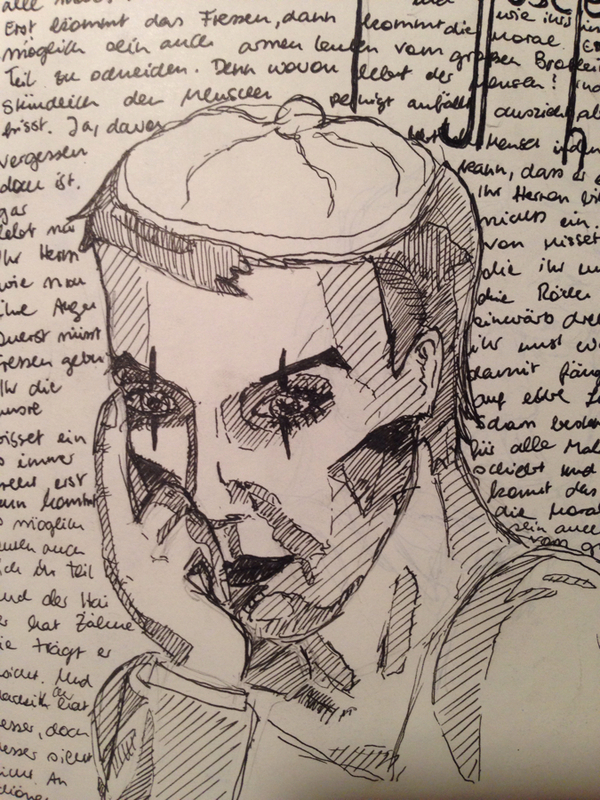 We feel that we need to formulate our understanding (and share it with) the outside world. This is what Vladimir Putin attempted to do on Thursday. This entry was posted in Russian History and tagged Putin. Bookmark the permalink.